Where to Stay in Quebec City: Advice from a travel-writer and Québec expert about the best neighborhoods to stay in Québec City, Canada! Includes 16 hotel and holiday apartment suggestions in Québec’s best areas. We created this guide in collaboration with Pamela MacNaughtan, the creator and editor-in-chief behind Urban Guide Quebec, a hyperlocal guide website focused on showing you the very best of Québec City, and the author and creator of the Urban Guides: Québec City Guidebook. Pamela has served as the local expert for this post by outlining the best neighborhoods to stay in Québec City. The Wandertooth team (Geoff and Katie) have added in hotel and holiday apartment ideas in each neighborhood. Disclosure: This Where to Stay in Québec City Guide contains affiliate links. That means we may earn a small commission when you use the links on this site to book a hotel, buy your travel insurance, etc.. You don’t pay anything extra, and it helps us cover our costs. If you’d like to learn more about how this works, you can read more under our Disclaimer page. Where Montréal is vibrant and loud, Québec City is charming and relaxed. Commonly referred to by locals as a ‘big village’, Québec City feels like a snuggly boyfriend, homey. This is a city where one can explore 400+ years of history in a short period of time. From the humble beginnings of the French colony of New France, to modern city that proudly displays its history, culture and traditions for all the world to see and enjoy. Québec City is the one place in Canada where I enjoy winter. It is not because I have decided to embrace icy streets and crisp (and sometimes absolutely frigid) winter air, but rather the city’s desire to embrace and celebrate life no matter how cold it is outside – the very reason for the creation of Carnaval de Québec, one of the biggest winter carnivals in the world. Whether you spend a weekend or a week in Québec City, you will likely fall in love with the city’s European charm, cobblestoned streets, old architecture, food, history and proud locals. Enjoy a café patio in warm weather to do a little people watching. Shop at local boutiques in the neighbourhoods of Saint-Roch, Saint-Jean-Baptiste and Limoilou. Explore Old Québec to learn about the city’s history. Dine on traditional Québécois cuisine at Là Là in the neighbourhood of Vieux-Port. Old Québec – Cozy and cobbled streets, gorgeous European architecture, and an old-world flair that may have you confused as to what continent you’re on: Old Québec is the star attraction of the city, and hard to beat as one of the best places to stay in Québec City, especially for a short visit. Vieux-Port: Located close to Old Québec, Vieux-Port is quiet and calm at night, making it the perfect place to stay in Quebec if you want convenience during the day, and quiet at night! Montcalm: Montcalm has recently re-branded itself as Québec City’s arts district, and has an upscale, hip vibe and aesthetic to it, as well as a vibrant nightlife scene. If you’re looking for a lively nightlife, Montcalm is the best area to stay in Québec City. Saint-Jean-Baptiste: Just outside the Old City walls, Saint-Jean-Baptiste will give you a taste of local living, while also being conveniently located close to the tourist centre of Old Québec. Plenty of shopping and dining options, with a few chain hotels as well as apartment rentals and small B&Bs. Saint-Roch – About a 15-to-20-minute walk from Old Québec, Saint-Roch is a great option for getting off-the-beaten-path, and into a local neighborhood that’s hip and happening. Despite being a bit far from the main tourist spots, you’re unlikely to feel down about staying in Saint-Roch, as it’s full of great cafés, shops and spots to eat and drink. If you’re interested in a local experience, and staying in a neighborhood filled with people going about their day-to-day lives, Saint-Sauveur or Limoilou could be a good choice. While you won’t find a massive selection of hotels in this area, you should be able to find short-term apartment rentals through services such as VRBO. So….Where Should You Stay in Québec City (A Summary)? Planning a trip to Quebec? Pamela has written a great guidebook to Québec City, Urban Guides: Québec City Guidebook. It’s available as an ebook via Amazon. If you’re also planning a trip to Montreal or Toronto, be sure to check out our Where to Stay in Montreal and Where to Stay in Toronto guides! Sitting comfortably at the top of almost everyone’s Québec City bucket list, Old Québec is filled with a mixture of French and British architecture (some buildings are 300 to 400 years old! ), narrow cobblestoned streets, charming cafés with summertime patios, fortified walls and stunning views. In summer, the streets are (at times) overflowing with people. In winter, each snowfall adds a layer of white magic that has me rushing to the nearest hill to make snow angels and small igloos. Walk along the Dufferin Terrace boardwalk, then up to the top of Terrasse Pierre-Dugua-de-Mons for a postcard shot of Château Frontenac, the Saint-Lawrence river and Old Québec. Stroll along the fortifications and drool over the stunning interior details at Maison de la littérature. Eat gourmet poutine at one of my favourite restaurants. Hit up Paillard for one of the best croissants in the city, and BEclub Bistro for a killer smoked meat club sandwich. If you’re in need of a quick café stop, swing by Chez Boulay’s Comptoir Boréal for a pot of Labrador tea (my personal addiction), or a cup of coffee, if you are so inclined. Take the funiculaire down to Petit-Champlain and walk down one of the oldest shopping streets in the city. Sip chocolat chaud at La Maison Smith in the square in Place Royale with a lovely view of Notre-Dame-des-Victories. Fairmont Le Chateau Frontenac – What’s arguably the city’s most iconic building, Le Château Frontenac is close to almost everything, including Notre-Dame de Québec Basilica-Cathedral and the Citadel, sporting splendid views of the mighty St. Lawrence River. Luxurious and a part of Canadian history, each of the rooms offers coffee and tea facilities, as well as offering an indoor pool, fitness room, spa and restaurant on site. In addition to being very large, it is a tourist attraction in itself, so book early. Le Coureur Des Bois – A beautiful boutique B&B in a charming old stone house, the old world charm is matched with modern conveniences like flat-screen TVs and Wifi. Offering cozy stone and brick walls, a gorgeous terrace to relax on after sightseeing, and breakfast served daily by very helpful owners, this property is well-located within a 10-minute walk to both the Basilica and Citadel. Past guests have noted a late check-in time; some rooms have shared bathrooms, so pay attention when booking. Hotel Manoir D’Auteuil – A small, but gorgeous and well-reviewed B&B within the old city walls. Easy walking distance to everything Old Québec has to offer including shops, bars and restaurants. Every room is different, with an art deco look throughout. Note that some rooms have quirky layouts (i.e. loft bathroom); if you book through Booking.com, use the “Special Requests” box at the time of booking to let them know your preferences. There is no elevator, but guests have said staff are eager to help. Hotel du Vieux Quebec – At the time of research, this is Trip Advisor’s top-rated hotel in Québec City, and all the Old City’s attractions are well within reach, most within 10 minutes. Fresh and airy rooms with old-meets-new aesthetic, gym and restaurant on site, and a guest lounge with a wonderful fireplace, games, and a great collection of free movies available to all guests to borrow. Cappuccinos and lattes, and fresh fruit-infused water available in the lobby all day. B&B Chez Hubert – Aside from that little perk, this cute B&B is in an ideal location about 10 minutes’ walk to Quartier Petit Champlain, the Basilica, and the Citadel. Each room has a private bathroom with toiletries, some rooms have a balcony and, of course, there’s a daily breakfast. Add to that, this property offers free parking, a huge bonus for self-drive travelers in a city where parking costs are quite high. If needed, contact the hotel to reserve your spot after booking. Hotel Champlain – A cheery and contemporary boutique with an affordable price tag, this hotel within the Old City walls offers cozy rooms, free cappuccinos and espressos to keep you going, and a great location. Past guests mention the friendly staff, overall comfort of the rooms and hotel, and great location. For those traveling by car, parking is available, but will cost you $24 (CAD) per day, and it’s best to contact the hotel in advance to reserve a spot. Photo ©: Pamela MacNaughtan. Used with permission. Close enough to Petit-Champlain and Place Royale to have old world charm, Vieux-Port has a quiet laid back vibe. During the day locals and tourists walk along rues Saint-Paul, Saint-Pierre and du Sault-au-Matelot looking for antiques and art. New local shops like Boutique Roseville and Lili & Olivia, which have nothing to do with art or antiques, are quickly becoming neighbourhood favourites. For breakfast, I highly recommend opting for a classic Québécois diner experience at Buffet de l’Antiquaire (open from 6am daily); try the breakfast poutine comprised of homefries, bacon, ham, sausage, cheese curds, egg and hollandaise sauce. It’s INSANE, and may stop your heart, but it is totally worth it. For a quick and healthy lunch stop by La Serre, a comptoir selling kale chips, salads, soups and juices. For dinner, go to Là Là for traditional Québécois cuisine like Tourtière. YUM! In summer, several festivals and events take place along the port, and the fountains and mist at Place des Canotiers is delightful when the air is hot and sticky. Cycle along the Saint-Lawrence river, admire the massive cruise ships when they come calling, and enjoy some soft serve ice cream from Canot à glace. In the evening Vieux-Port quiets down significantly, making it an ideal neighbourhood for a good night’s rest. If you’re in need of great cocktails, stop by Bar Artefact at Auberge Saint-Antoine. Vieux-Port is the perfect neighbourhood if you want to spend your days mostly in the old city, but want to retire to a more quiet neighbourhood at night. Hotel le Priori – Located in the heritage home of a famous 18th century architect, this charming hotel also boasts a well-liked restaurant on site. Clean, comfortable, well appointed rooms with exposed brick feature walls bring in that old world feeling. The hotel is located in “Lower Town” close to many boutique shops, pubs and cafes, and there is a funicular to go up to the Old Town center, just four minutes from the hotel if you don’t want to walk. Auberge Saint-Antoine – A beautiful boutique property with the perfect blend of cozy and contemporary. Highly rated not only for its location, but also for little touches like rain showers, heated floors, and goose down duvets. Minibars and coffeemakers available in each of the well-appointed rooms, two restaurants on site, as well as a fitness center and sauna. Walking distance to pretty much everything Old Québec has to offer! Hotel 71 – A modern hotel in a heritage building that’s surrounded by the charm of the Old Port area. Boutique shops, art galleries, cafes and restaurants are all steps from the front door, with rooms offering large bright windows and wonderful bathrooms complete with walk-in showers and toiletries. Excellent touch: this hotel has a self-serve wine bar! Past guests have suggested requesting a ‘city view’ room on one of the upper floors if possible. A little more upscale than some of the other neighbourhoods near Old Québec, Montcalm is home to vibrant nightlife – including the city’s hottest nightclub, Maurice – and gourmet restaurants. Cafés and boutiques and the site of the famous battle between the French and the English in 1759, the Plains of Abraham. Of course, we cannot forget Parliament Hill, or the CRAZY HUGE music festival that takes place every year, Festival d’été de Québec. Similar to Mile End in Montréal, many of the houses in Montcalm have tall wrought iron stairs out front. During the day, relax at the Plains of Abraham or admire the art at Musée national des beaux-arts du Québec. Have lunch at Frida comptoir Mexican on Avenue Cartier or a sandwich at Fastoche sandwicherie (skinny baguette sandwiches FTW!). In the evening, Grande-Allée is the go-to street for dinner and drinks. Cocktail-lovers should head to L’Atelier (known as the best cocktail bar in the city), while whiskey and cigar enthusiasts will find a home at Société Cigare across the street. When you finally crawl out of the nightclub or bar in the wee hours of the morning, go to Chez Ashton for some hot gooey poutine. Absolute perfection! C3 Hotel Art De Vivre – A hip and contemporary boutique hotel in Québec City’s arts district, this hotel features gorgeous rooms in a beautiful old building filled with contemporary art, quirky touches, and a well-loved rooftop terrace. Past guests mention the overall ambience of the hotel and friendly staff as positives of this property, as well as the location in a local-feeling neighborhood that’s still convenient. Hotel Relais Charles-Alexandre – Located in a lovely brick building, this property has the look of a family-run B&B, and offers good value in the heart of the Montcalm arts district. Past guests mention the friendly staff and feel of a small hotel as pluses, as well as the location within walking distance or a quick taxi ride to Old Québec. For those with mobility issues, the stairs may present an issue, however. A short walk from the old city walls, Saint-Jean-Baptiste is a local neighbourhood known for its restaurants, shopping and bar scene. As well as being home to Le Drague, a multistory gay bar and cabaret club that has been a Québec institution for over 30 years. Instead of grand hotels, you’ll find small auberges, B&Bs and apartment rentals. Start the day with a smoothie at Blender bar à jus (a personal favourite) or a coffee at Cantook. Visit Bibliothèque Claire-Martin, a church that has been converted into a beautiful library. Rent a bike from Velos Roy-O or visit Érico’s choco-musée – and be sure to order decadent chocolat chaud, the BEST hot chocolate in the city – before going to lunch at Le Projet or Bols et Poké. Shop at J.A. Moisan, one of the oldest running grocery stores in North America. A Victorian era shop, J.A. Moisan is a go-to for picking up picnic items. Buy some duck fat to take home, then rub it all over your turkey before cooking it. Trust me, you will not regret it! Unless, of course, you’re vegetarian. In the evening, wine and cheese connoisseurs flock to Le Moine Échanson. For Québec craft beer, go to Le Projet, Bar Le Sacrilège or Fou-Bar. For live music and good times, go to Pub Nelligan’s or Ninkasi Saint-Jean. For cheap greasy eats, always go to Snack-Bar Saint-Jean! Hilton Québec – A 5-minute walk from Québec’s old city walls, the standout features of this Hilton include a heated outdoor pool, fitness centre, well-equipped rooms (TVs, coffee/tea facilities, MP3 dock), and great views. Past guests have mentioned great staff, views, and a good onsite restaurant/bar, as well as location. Overall, it’s exactly what you probably expect from a Hilton: clean, comfortable, and consistent. Marriott Downtown – Another 4-star chain hotel option, this Marriott features on-site restaurant, fitness centre, business centre, and comfortable rooms with in-room tea/coffee and a fridge. For travellers that are driving, there is a public parking garage nearby, and past guests consistently mention the staff as being particularly friendly and helpful. Convenient location a few minutes walk to Old Québec. After exploring the more popular neighbourhoods, it is time to venture a little further. Neighbourhoods like Saint-Roch, Saint-Sauveur and Limoilou see few tourists, which is why many locals choose to live here (or, if they are like me and live in the old city, they choose to flock to these neighbourhoods to escape the crowds in summer). Each of the neighbourhoods below are easily accessible on foot, but they can also be reached by bus. Depending on the day, I often walk over and then opt to take a bus home. That being said, walking home involves three rather steep hills and most days I just don’t want to deal with them! Possibly one of the best neighbourhoods in Québec City, outside of Old Québec, Saint-Roch is a go-to for shopping, cafés, restaurants and live music. A day typically starts at Saint-Henri micro-torréfacteur café on rue Saint-Joseph Est where I buy a pot of Labrador tea and a freshly made artisanal donut (Lime Coconut is TO DIE FOR!). While the ladies shop at Québec boutiques like Swell & Ginger and Mademoiselle B, the guys can hit up Rituels, a barber supply store that will have your inner hipster jumping for joy. And, if that is not enough, there is always KRWN, a barbershop/café/men’s boutique. If you’re feeling peckish while shopping, hit up Deux22, a clothing store and Mexican restaurant. Yes, really! The food is fairly authentic and the clothing is pretty good too. If Mexican isn’t your thing, go to Bureau de Poste for $5 plates or Nina Pizza Napolitaine for pizza you’d swear was made in Naples. At night, everyone goes to Le Cercle for live music. Noctem, Korrigane and La Barberie are a must for locally made craft beer. Les Lofts St-Joseph – Offering bright, spacious, and beautiful loft apartments, these look like a great ‘home away from home’ option, as well as a good choice for those who want to cook (there’s a grocery store across the street, and units have ovens, microwaves, and dishwashers). A 15-minute, hilly walk to Old Québec, this area is worth exploring on it’s own, and past guests mention enjoying the shops and restaurants nearby. Parking is available. Hotel PUR – Bright, clean, and modern, with funky decorations and illustrations throughout, this Starwood property fits that ‘affordable chic’ category of hotels, offering an upscale feel while leaving enough in the wallet for all the chocolat chaud your heart desires. An on-site restaurant, fitness centre and indoor pool, and parking is available. As with other hotels in this area, it’s about a 15-minute walk to Old Québec. Best Western Plus Centre-ville – An affordable mid-range option in the neighborhood, this Best Western offers an indoor pool and hot tub, fitness centre, and comfortable rooms with in-room coffee. Past guests mention value for money of this place, but indicate parking is a tad expensive, at $25 per day (CAD). This hotel is about a 20-minute walk to Old Québec, with a lot of hills to contend with. There are nice dining options nearby, however. An up-and-coming neighbourhood, Saint-Sauveur was once quite wealthy, before residents moved into the suburbs and the neighbourhood became more blue collar. While the neighbourhood is mostly residential, there is an increase in gourmet restaurants, as well as a micro-brewery, Brasserie Griendel. Kraken Cru is a raw restaurant serving up oysters, which was also voted as one of the best new restaurants in Canada by enRoute Magazine. Le Pied Bleu is a go-to for Sunday Brunch and Le Renard et la Chouette is all about Québécois comfort food. The further you venture into the neighbourhood, the more likely you are to stumble upon a small family run diner serving up hamburgers, spaghetti and other fast and easy eats. 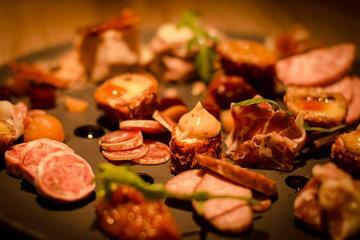 While not gourmet in any way, these places have their own charm and the experience can be fun as long as you don’t mind that the owners may not know English. Located across the Saint-Charles river, Limoilou is another favourite local neighbourhood. A place for shopping and good food, cafés and a quiet atmosphere. Popular restaurants like La Planque can be found here, as well as local favourites like O.S. Rotisserie and Soupe et Cie. Nektar café (coffee shop) and Le Lièvre et la Tortue (tearoom) are among my favourite places to work or relax. Enjoy the quiet public spaces or shop at boutiques like Article 721 and Conserverie du Quartier. If you’re looking for Southeast Asian food, head over to 1re (1st) Avenue for a selection of Vietnamese and Thai restaurants. If you love craft beer, head over to La Souche on chemin de la Canardière. So Where Should You Stay in Québec City? Where you stay in Québec City depends on how close you want to be to the old city. There are plenty of hotels and B&Bs within the old city walls to choose from, so you won’t have to look far for the perfect fit. Old Québec is charming and beautiful, and being in the heart of the action can be quite fun. I’d recommend spending a couple days in Old Québec, then moving into one of the more local neighbourhoods if you have the time. Montcalm and Saint-Jean-Baptiste are both within a 5 to 7 minute walk from Old Québec, making both good places to base yourself and experience both the local and tourist sides of the city. There are plenty of restaurants, cafés, bars, shopping and attractions. And many of the biggest festivals and events take place in these neighbourhoods (New Year’s Eve is always celebrated on Grande-Allée). Saint-Roch is quite vibrant at night, but after 3am the neighbourhood can get a tad gritty. That being said, it is a good base if you want to experience a more local side of the city and there are plenty of hotels and B&Bs to choose from. Québec, for the most part, is a safe city. Similar to Montréal, the bars stay open until the wee hours of the morning, and some restaurants like Chez Ashton are open right along with them! In summer, the city is thriving with festivals (Festival d’été de Québec and Fêtes de la Nouvelle France being the largest) and events. There is always something happening. In winter, the crowds decrease and the locals embrace the city and the crisp winter air. This is a city where you’ll get quizzical looks for walking around in a winter jacket, hat, mittens and good boots, but no snow pants. Of course, Carnaval de Québec is a big deal each year. While you do not need to speak French to visit Québec, it is best not to assume that everyone speaks English, because they don’t. Smile, be polite and make an effort to speak French: the locals are usually friendly. I hardly speak French, and I get by very well in Québec City. In fact, I have become a tad lazy in learning more French. Enjoy your time in the city. Walk until your feet hurt, then take a break at café and do a little people watching. Do the cheesy tourist stuff: walk the old city walls and take a stupid amount of photos of Château Frontenac from every conceivable angle, visit La Citadel and the Musé du Fort, window shop on rue du Petit-Champlain. Take photos, and stuff yourself with delicious buttery croissants. Try Québécois foods like poutine and tourtière. Ride the ferry to Lévis, and cycle out to Montmorency Falls. Take a walking tour or the open-top hop-on hop-off tourist bus, so you don’t miss anything! Embrace the city with your heart and mind and prepare to fall in love as I did. Who knows, maybe we’ll become neighbours some day. Jean Lesage International Airport is located about 15 kms from Old Québec. If arriving by plane, the best way to get into the city is by taxi, which is a flat fee of $35 CAD. There is a bus, however the first stop is a 20-35 minute walk from the airport. Orléans Express offers bus service between Montréal and Québec City, which takes you to the bus terminal beside Gare du Palais, the train station in the neighbourhood of Vieux-Port. From there you can walk up to Old Québec or take bus #11 for $3.50 CAD. Québec City is best explored on foot, however some of the outer neighbourhoods are more easily accessible by bus. A one-way ticket is $3.50 CAD or $3 CAD when you buy it from an authorized vendor (Jack & Jill Tabagie in Old Québec is one of many). If you’d like to venture into a couple outer neighbourhoods, as well as Montmorency Falls, opt for an unlimited weekend pass for $15.50 CAD or buy day passes for $8.50 CAD. Be sure to download the RTC Nomade app for information on routes and (correct) bus status. While Québec City does not have a Bixi bike program, there are a few places where you can rent a bike for 4-hours ($20 CAD), 24-hours ($30 CAD) or more. Keep in mind that some rental shops require a security deposit of $250 CAD. The most popular neighbourhoods to stay/live in are Old Québec, Vieux-Port, Montcalm and Saint-Jean-Baptiste. Our hope with this Where to Stay in Québec City Guide (and our Where to Stay in Montreal, Where to Stay in Vancouver…you get the idea) is to make it easy to find the best area to stay in Québec City for your particular travel style, goals and budget. Québec City is a city of wonderful old and charming neighborhoods, and it’s worth figuring out where you want to base yourself and where you want to explore! As we hired a local (Pamela) to write this guide and impart her expertise about Québec City, we’re a bit limited in terms of hotel knowledge…because, of course, locals don’t live in hotels! So, what we’ve done is go through and choose some of the highest rated hotels in each neighborhood, and when we couldn’t find a hotel, we listed a holiday rental. Basically, we put in the research for you, and chose the places we personally would want to stay, and the places we felt we’d be comfortable recommending to a friend or family member, across different budget ranges. Really, we want to help you have a fantastic visit to Québec City be it a grand Canadian tour, or a short Québec City break. And, we want you to be able to do so without spending hours on the internet, reading reviews and cross-checking locations on a map. Hopefully we’ve succeeded…but please don’t blame us if we haven’t – at the end of the day, we expect you’ll check the most recent reviews and specific conditions in the city, using our listings as a starting point and framework, and choosing then selecting the best hotel and area to stay in Québec City for your own trip! Thanks for expressing your word regarding to Quebec city. I perfectly agree with your point Vieux-Port is one of the best place to stay in night, because it keeps calm. if you want convenience during the day, and quiet at night!, so I would like to prefer this place.